1 of 4 In a medium pot, combine beans; shallots; 1 clove of the garlic, sliced; the vinegar; sugar; 2 tablespoons of the dill; 1/2 teaspoon of the salt; 1/4 teaspoon of the pepper; and 3 cups water. Bring to a boil and cook 3 minutes. Pour into a bowl; cool. Cover with plastic wrap and refrigerate overnight. 2 of 4 Heat oven to 400 degrees F. In a small bowl, combine bread crumbs; 3 tablespoons of the parsley; 2 teaspoons of the paprika; remaining 2 cloves garlic, minced; 1 tablespoon of the dill; 1/2 teaspoon of the salt; and 1/8 teaspoon of the pepper. In a separate small bowl, whisk together 1 tablespoon of the oil and the mustard. Brush mustard mixture on pork. Pat bread crumb mixture evenly on tenderloin. Place tenderloin on a baking sheet. 3 of 4 Toss potatoes with remaining 1 tablespoon oil, 1 teaspoon paprika, 1/2 teaspoon salt and 1/8 teaspoon pepper. Place on a separate baking sheet. 4 of 4 Roast pork and potatoes at 400 degrees F for 25 minutes or until pork reaches 145 degrees F and potatoes are fork-tender. Toss potatoes with remaining 1 tablespoon each of the dill and parsley. 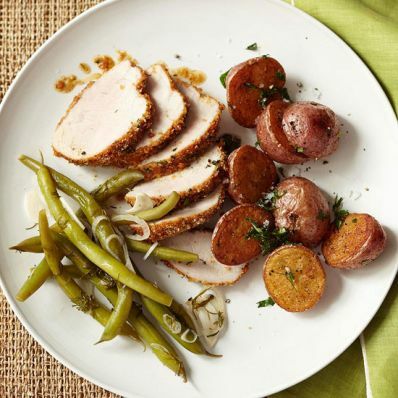 Allow pork to rest for 5 minutes, then slice and serve with potatoes and pickled green beans.